The Lévay Villa Hotel in the vicinity of downtown of Miskolc, close to the Népkert-Public Garden is located in a friendly environment. The building was built in the most beautiful part of the city, in a green belt garden suburb in 1916. Our company, maintaining the style of the beautiful building, developed and renovated the villa in 2002. There are 26 rooms available for our guests. From our offer you can choose single and double rooms, three-four-bedrooms. We have LCD TV with English tv channels and WIFI in every room for the recreation of the guests. 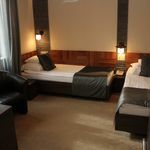 We have a suite up to 6 persons, according to the guests demand, with two bathrooms, a special room for disabled people and a room for non-smokers as well. The furnishing of the rooms meets all the requirements of European standards. Our breakfast-room with its familiar milieu offers in the daytime a suitable place for business meetings, conferences up to 30 persons. The hotel has a private parking place monitored by a camera system. Our hotel was recently extended with a recreation unit. There are two Finnish saunas, a diving pool with cold water, a steam hydro massage shower-bath, a solarium as well as a fitness-room. All these services are offered, at a favourable price-value ratio, on a competitive price for our guests. Nearby of the Lévay-Villa-Hotel there is our restaurant, the first member-restaurant of the Belgian Beer Café international chain with long tradition, the Café du Boucher Belgian Pub and Restaurant, one of the most popular restaurants of Miskolc, where our guests receive 10 % discount. 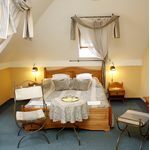 The rating of Lévay Villa Hotel Miskolc is 9.4 from the maximum 10, 171 based on actual and valid guest ratings and reviews. "Kedves, udvarias, segítőkész személyzet, tiszta, kényelmes, tágas szobák és nagyon jó reggeli széles választékkal. Nagyon elégedettek voltunk. :)"
"Kedves, barátságos személyzet, igényes, modern, tiszta szoba." "Könnyen megközelíthető. Ami külön tetszett, hogy zárt helyen lehetett parkolni." Based on the reviews and comments of actual guests, the services of the Lévay Villa Hotel Miskolc have received a high rating of 9.3/10.